BRIDGETOWN - Category 5 Hurricane Irma will start bringing effects to the Leeward Islands later today. Hurricane conditions are expected within the hurricane warning area in the Leeward Islands by tonight, with tropical storm conditions beginning later today. Tropical storm conditions are expected within the tropical storm warning area where hurricane conditions are also possible. Hurricane conditions are expected to begin within the hurricane warning area in the British and U.S. Virgin Islands and Puerto Rico tomorrow, with tropical storm conditions beginning tonight. Hurricane and tropical storm conditions are possible within the watch area in the Dominican Republic by early Thursday. And the National Hurricane Centre (NHC) has given an idea of what else residents of the affected areas should expect. Irma is expected to produce total rainfall accumulations of 4 to 8 inches with isolated maximum amounts of 12 inches across the northern Leeward Islands, the British and U.S. Virgin Islands, and Puerto Rico. These rainfall amounts may cause life-threatening flash floods and mudslides. What will happen at sea? Swells generated by Irma will affect the northern Leeward Islands, Puerto Rico, and the U.S. and British Virgin Islands during the next several days. These swells are likely to cause life-threatening surf and rip current conditions. The combination of a dangerous storm surge and large breaking waves will raise water levels by as much as 7 to 11 feet above normal tide levels along the coasts of the extreme northern Leeward Islands within the hurricane warning area near and to the north of the center of Irma. 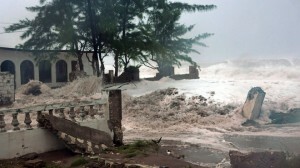 Near the coast, the surge will be accompanied by large and destructive waves. The combination of a dangerous storm surge and the tide will cause normally dry areas near the coast to be flooded by rising waters moving inland from the shoreline. The water is expected to reach the following heights above ground if the peak surge occurs at the time of high tide. The deepest water will occur along the immediate coast in areas of onshore winds, where the surge will be accompanied by large and destructive waves. Surge-related flooding depends on the relative timing of the surge and the tidal cycle and can vary greatly over short distances.